While still fragmented, we are witnessing the emergence of a global commercial legal order independent of any one national legal system. This process is unfolding both on the macro-level of state actors as well as that of private individuals and organizations. On the macro-level, the sources of this legal order are complex international agreements; on the micro-level, private contracts employing commercial customary practices and arbitration are driving this process forward. Yet there is no comparable evolution occurring (in any substantial sense) in non-commercial areas of law such as criminal, tort, or family law. There is an overall asymmetry in the development of transnational legal order. But why is this happening? 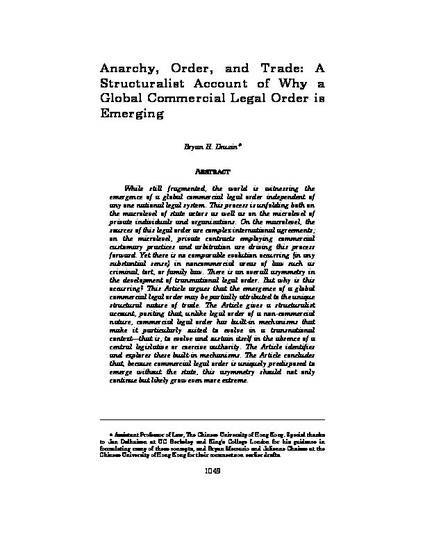 This paper argues that the emergence of a global commercial legal order may be partially attributed to the unique structural nature of trade. The paper gives a structuralist account, positing that unlike legal order of a non-commercial nature, commercial legal order has built-in mechanisms that make it particularly suited to evolve in a transnational context—i.e. to evolve and sustain itself in the absence of a central legislative or coercive authority. The paper identifies and explores these built-in mechanisms. The paper concludes that because commercial legal order is uniquely predisposed to emerge without the State, we should expect this asymmetry to not only continue, but likely grow even more extreme.